If you’re anything like me, you love going through lists of the best works of all fields of art be it movies, books, paintings or music on the internet. Our minds love lists. And order (though some of our workspaces and closets might say otherwise). 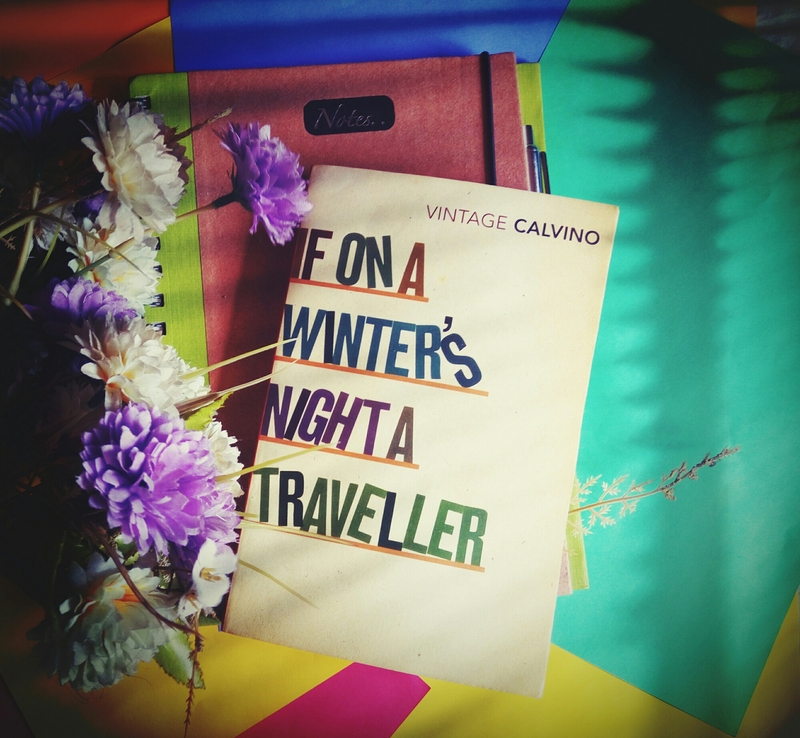 And I was recently going through lists titled “books you must read before you die” and If on a Winter’s Night a Traveler came up multiple times. And since I’d had this on my shelf for a long time, I decided to pick it up. And I have to admit, this book had me put off reading it for a long time. But I finished it anyway. Unlike other times that I usually put down a book when I think it’s going to be slow and boring and never pick it up ever again, something about Calvino’s writing had me feeling that I’ll miss out on something genius if I just gave up midway. I’d heard it has one of the most striking beginnings ever. And then I realized what was supposed to be ‘striking’ about it was that the readers were addressed as protagonists. And if you’ve been an R.L Stine fan like me when you were a kid, glued to Goosebumps for long hours of your school days, you know it’s not really that bizarre. But his style made me feel compellingly responsible for the plot, freeing him of all accusations for muddling with my mind to a maddening height. This novel is a beautiful portrayal of the feats of reading and writing, and making the protagonist such an avid reader had me feeling guilty for not having read enough books in my lifetime. The title seems to be left incomplete like a premonition for the readers that this book is going to be a callous taunt on our thirst for closures. The title screams thriller, but it has romance, suspense and so much more amassed into it. And though the manuscript looks like a compilation of a number of beginnings of numerous gripping stories, each chapter lights up some part of the ways in which our minds work; ways in which we desperately seek patterns in randomness and quench our thirsts to seek meaning in the unknown. I was stunned when I found out what Calvino grounds this book on but suddenly the novel started making much more sense. He based his entire work on the ‘semiotic squares’ model published by a group of mathematician-writers who called themselves the Oulipo group, which he himself was a part of. This concept was borrowed from A J Greimas’s book called ‘Du Sens’. For example, the first chapter is based on a single semiotic square with co-ordinates on edges: alike or conflicting. So the course of every chapter and every plot twist was decided by these squares (or rather, by their coordinates). So what seems like an arrangement of beginnings of stories Calvino seemed to have had begun writing but could not finish due to a writer’s block is actually a novel so planned as to force us to take a serious look at the construction and meaning of this world. I think the crux of this novel is search of meaning. The writer deals with the readers harshly by refusing closure to each chapter especially when it gets gripping. And kudos to those he managed to keep engrossed till the end (like me). Like the reader and Ludmilla, I was stubborn in wanting to find meaning and closure in this book, owing to the classic characterization of the practice of “reading”. It begins to get interesting as the story of “your” (the reader’s) life builds up analogically to the stories “you” are reading. I had to finally give up looking for closure halfway through the book and just soak in all the insight he wanted to throw light on about our minds. If you have read the book, you know your mind was blown away from that one single concluding chapter. And if you haven’t or had given up reading midway, be sure to begin or resume with all the patience you can muster. I cannot say I enjoyed the book, but I was mind-blown the moment I’d put it down (I was actually expecting to be exhausted and dizzy). The volatility of narration, plot variations first had my mind thirsty for meaning and order in all the chaos my eyes were skimming through, but finally had me surrendering to the disorder and seek meaning in what was presented in a disarrayed manner instead. And when I found out that the plot was based on something logical and controlled, I finally made my peace with Calvino. But I also become conscious that my mind could after all, submit to all the pandemonium by the time I reached the end of the book, ignorant as I was of the rationale it was based on initially. So why this undeniable need, this gripping thirst to exist within orderliness? And maybe making us give this a thought had been his intent from the very beginning. And how well played, too! If you have read this book or are planning to read it, let me know in the comments section below or send me an email. I would love to know what you think. I MUST go for it…..the review provokes! Finally! Someone who has read this book. I have been recommending this to people ever since I read it, or maybe I should say, travelled through it, because it is in many ways like a journey. I agree! It is so much like a tempting and tiring journey at the same time that you simply *have* to make because of the gripping plot that just keeps you assured that it is all going to be worth it in the end. I’m glad to have found someone who’s read it. Honestly, I didn’t know what to expect from it. The plot, for the lack of a better word, is somewhat teasing. To me, it was more about the journey than the ending, all those little stories, so different yet fitting together so perfectly. It’s an absolute masterpiece. And how! When I finally found out the groundwork the book was based on I started appreciating his writing style even more; if that’s even possible. I must admit I came to know about it only after reading your article. It provided me with a glimpse of the order lying beneath all the apparent chaos, although I’m not smart enough to grasp it in it’s entirety. You don’t really have to comprehend it completely to feel the contentment of cognisance that the book wasn’t written because the Calvino was feeling erratic and impulsive. And that really warrants all the negative bickering about the haphazardly characteristic of the plot. It’d be a daunting task to write an entire novel based on impulsiveness, especially one of such quality. I’m having a hard time believing someone could bicker negatively about this particular book, but then again, stranger things have been known to happen. I was dismayed when I read comments on Goodreads about this book too! But you’re right, such strange things happen owing to diversity in opinions and choices and that’s okay. Thankyou so much for the reblog. It is highly appreciated! This is so sweet of you. Thankyou and yes, that is definitely the end goal: to always and only write about what I absolutely believe in passionately. Thankyou again! This article iѕ actually, I’m thankful for the article post. This is so encouraging! Thankyou.